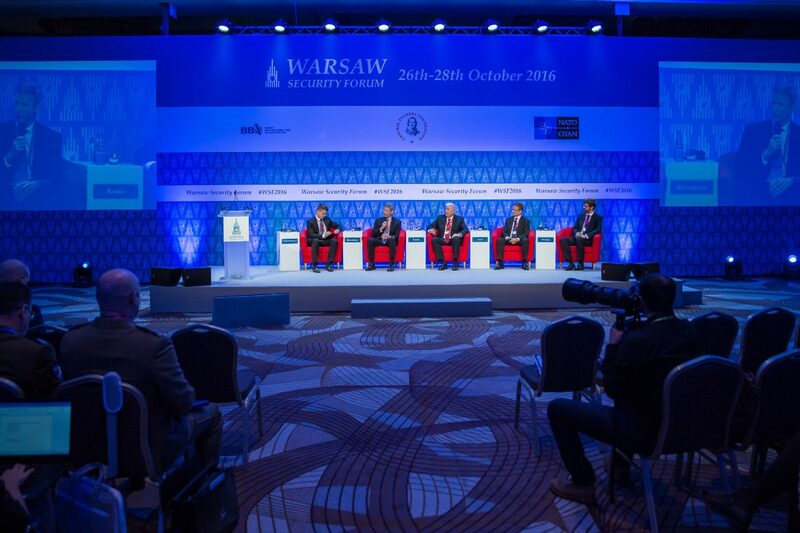 During the first day of the international conference, Warsaw Security Forum 2016, a technology, arms-industry-oriented sub-conference Security Beyond the Horizon was held. In the course of the SBH, representatives of defence companies presented their most advanced products and had the possibility of taking part in discussion panels relating to the issues of Polish defence. The conference started with welcome remarks form the president of the Casimir Pulaski Foundation, Mr. Zbigniew Pisarski – the organizer of the Warsaw Security Forum 2016. Opening speeches from high-level officials from the Ministry of Economic Development and Ministry of National Defence of the Republic of Poland, respectively by Mr. Jerzy Kwieciński, Secretary of State and Mr. Wojciech Fałkowski, Under Secretary of State. In his speech, minister Kwieciński focused on the issue of reindustrialization and pointed the distinct significance of the arms industry to the Polish economy, especially in the context of economic strategy of the Polish government and raising spending on armaments. He also mentioned the need of change of practices related to the procurement of the military hardware and thus, its improvement, as well as the need for cooperation of Polish arms industry with foreign partners. Minister Fałkowski, on the other hand, focused on the issues of security and defence, as well as the geopolitical situation of Poland after the events in Ukraine. He also recalled the NATO Summits in Newport and Warsaw and pointed out the need for broad understanding of security and the need for further reinforcement of military capabilities of Member States of the Alliance in the Middle-East Europe. The first appearance, from the industry side, was made by Mr. Szczepan Ruman, Director of the Analysis and Strategy Office of the Polish Armaments Group (PGZ). In his speech, Director covered such topics as PGZ’ capability to provide cybersecurity to their client, especially for the Polish Armed Forces. Mr. Ruman stressed, that the PGZ is in the process of acquiring an IT company Exatel, which will allow the Group to master necessary capabilities to provide equipment and services essential to providing cyber security. He stressed that within the PGZ, there is a number of companies, which have enough capabilities to provide customers with cybersecurity, but Exatel is to become integrator of all aptitudes of particular companies in aforementioned scope. After Mr. Ruman speech, it was about time for the first panel session to begin, titled Battlefields of the Future: In which Direction will Battles Evolve and How Technology Will Decide Their Outcome?, in which, along the PGZ representative, representatives of foreign enterprises, John Baird of Raytheon, Howard R. Bromberg of Lockheed Martin and Sveinung Alne of Kongsberg were taking part. Panelists responded to questions regarding reacting on future threats coming from Russia. Many experts indicated to the crucial role of network-centric warfare on the battlefield of the future and of sensors providing appropriate situational awareness. What is significant, remarks concerning the broader aspect of security in the future arose, namely possession of a proper economic background. It was underlined, that the threats of the battlegrounds of tomorrow will require systems, which have the history of products’ permanent development. Panelists pointed to the important role of cybersecurity and to the need of having well-equipped forces of territorial defence and the inexorableness of inter-operability of different weaponry systems of armed forces of NATO Member States. Next presentation, Patriot for Poland: Effective Today, Ready for Tomorrow was held by the abovementioned John Baird, vice-president of Raytheon Poland. The presentation hinged on Poland’s need of developing medium range anti-aircraft and missile defence. As an important element in development of such system, he distinguished the importance of a secure chain of supply and the role of Polish Armaments Group (PGZ) in this regard. In the following part, Mr. Baird presented the proposed to Poland evolution of Patriot system based on the technology of Gallium Nitride; he also explained the idea of implementing low-cost interceptor in the Polish version of the system. Security Beyond the Horizon was also an opportunity for the Polish Armed Forces to present themselves. After Mr. Baird’s presentation, Col. Mieczysław Malec, Deputy Head of the Strategic Defence Review Unit (Poland) took the stage. In his speech, he described the issues tied to the Polish SDR, called out reference points used to compose Polish SDR, and emphasized its goals. In addition to the above, Colonel focused on visualization of areas, which the SDR concerns, and he presented review’s guidelines and dangers standing in the way of its realization. The document should be ready by the beginning of 2017. After col. Malec’ speech, second panel was open, titled Silent Wars: Will Submarines Become the Decisive Tool in Gaining Control Over the Seas and Oceans?, featured Mr. Roger Berg from SAAB Kockums and Philipp Schön from ThyssenKrupp Marine Systems. The topic discussed by the panelists, naturally moved to the Polish program of acquiring submarines called Orka. Panelists noted that financing of modern armament programs leads to economic growth and every one billion spent on technologically advanced defence systems equals two billions in real economic growth. Speaker also pointed the importance of having appropriate combat capabilities by the submarines and the need for technology transfer, which is crucial for the buying country to exploit possessed equipment to the fullest. In the last presentation before coffee break, held by the Philipp Schön of the TKMS, titled ThyssenKrupp Marine Systems: Submarines and Surface Vessels – Proven Technology and Unique Partnership for Poland’s Security, Mr. Schön elaborated on some issues he briefly touched in the previous session. He evoked model of cooperation between TKMS and companies from various countries, which, in turn, unequivocally benefitted from such cooperation and are today capable of independent production of submarines. Schön also described present situation of TKMS in the field of orders for submarines and he underlined the need for cooperation with the PGZ in regard to the program “Orka”. Mr. Schon exposed the fact, that the company he represents is one of the few manufacturers of submarines equipped with air-independent propulsion systems, which, among NATO states, achieved biggest export success. After a brief recess, Security Beyond the Horizon returned with second presentation of a representative of the Polish Armed Forces. Col. Robert Łukawski, Deputy Director of the Inspectorate for Implementation of Innovative Defence Technologies took the stage with his speech Future of Military Technologies – How Can Poland Become a Regional Leader?. He spoke of the Inspectorate’s approach toward identification and selection of modern technologies for Polish Armed Forces. He pointed to the need of putting the whole development of military technology, including economic aspects, into a broader scope. He also presented military perspective on new technologies. In another part of his presentation, he introduced Inspectorate’s perspectives and ways of proceeding and assessment of military technologies. Finally, col. Łukawski highlighted possibilities for international cooperation in the field of arms technology development. Next presentation, titled Transforming Governmets to a National Advanced Security Operating Centre (ASOC) Strategy, conducted by Mr. Brett Taylor from BAE Systems Applied Intelligence, focused on the subject of transforming governmental and military information and communications (IC) networks for their greater security. He pointed to the problems related to the currently existing systems and Security Operating Centres (SOC) and BAE Systems solutions for their reinforcement and rise to a more advanced level (ASOC). As crucial, he identified looking into a broader national context of ASOC’s technology implementation and the need for trained personnel, which should originate from nationals of a given country. Along the conclusion of the panel about modern aviation systems, the topic did not disappear as the last presentation was run by Mr. Tony Ogilvy – representative of the SAAB company, who delivered a speech titled Saab Gripen – The SMART Fighter. In the presentation he emphasised valour of Swedish construction (i.e. balance between combat abilities and requirements for the final user), international export success and multirole features of the construction. Moreover, from the Polish perspective, it was surely interesting to see the presentation of Gripen’s evolution and the Brazilian contract on multirole aircraft – in this part SAAB’s representatives stressed benefits for the local arms industry. The final moments of the Security Beyond the Horizon were concluded with the appearance of two distinguished guests of the Warsaw Security Forum 2016, Gen. Philip M. Breedlove and Gen. Sir Richard Shirref – respectively former SACEUR and former deputy SACEUR. They both focused on threats coming from Russia and the requisite of rebuilding forces of the Alliance, so that it can defend its Member States. After the summits in Wales and Warsaw, NATO – in their opinion, should concentrate on reinforcing the deterrence capabilities to cause hypothetical attack on allied states costly and entail appropriate response.